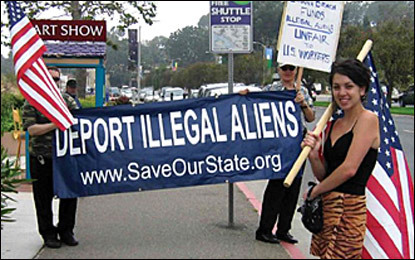 Editor’s Note: After issuing this report in December 2007, the Southern Poverty Law Center added the Federation for American Immigration Reform to its list of hate groups. None of this — or any other material evidencing the bigotry and racism that courses through the group — seems to have affected FAIR's media standing. In just the first 10 months of 2007, the group was quoted in mainstream media outlets nearly 500 times with virtually no mention of its more unsavory aspects. FAIR President Dan Stein was featured on CNN's "Lou Dobbs Tonight" at least 12 times in the same period, along with countless appearances on other television news shows. And, perhaps most remarkably of all, FAIR has been taken seriously by Congress, which has called upon its officials to testify on immigration more than 30 times since 2000. 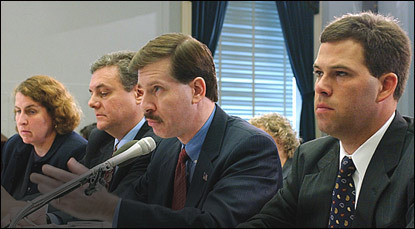 FAIR official Dan Stein, second from left, testified before a House Judiciary subcommittee in 2003, one of 30 FAIR appearances before Congress since 2000. FAIR's opinion is sought despite its well-documented links to extremism. Joe Turner started the group SaveOurState.org, which tolerates neo-Nazis' presence at anti-immigration rallies. That was the least of it. In a 1992 interview with Omni magazine, Hardin said he supported abortion — "A fetus is of so little value, there's no point worrying about it" — as "effective population control." He argued the Third World is filled with "the next generation of breeders" who need to be stopped. He discouraged aid to starving Africans because that would only "encourage population growth." Hardin wasn't alone. 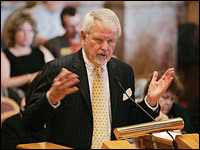 A current FAIR board member, three-time Democratic governor of Colorado Richard Lamm, sounded a similar theme in 1984, while still governor, saying "terminally ill people have a duty to die and get out of the way." Like Tanton, Lamm seems to fear a coming race war. In his futuristic 1985 novel, Megatraumas: America at the Year 2000, Lamm sketches it out like this: "[O]ur lack of control of our borders allowed 2 million legal and illegal immigrants to settle in the United States every year. That caused unemployment to rise to 15.2 percent by 1990 and 19.1 percent this year. … [T]he rash of firebombings throughout the Southwest, and the three-month siege of downtown San Diego in 1998 were all led by second-generation Hispanics, the children of immigrants." After Hardin's death, John Tanton created in honor of his mentor a group called The Garrett Hardin Society, devoted to "the preservation of [Hardin's] writings and ideas." On the society's board are Tanton, Wayne Lutton and U.S. Inc.'s recently appointed chief executive, John Rohe, the author of an adoring 2002 biography of Tanton and his wife that reads like the life of a saint. By and large, FAIR has escaped negative publicity, generally being depicted as a mainstream critic of American immigration policy. But there are exceptions. Following the defeat of the bipartisan immigration package this summer, FAIR flew into action one more time. This time, it went after the DREAM Act, a widely supported, bipartisan bill that would have provided a path to citizenship for undocumented immigrant students accepted to college. FAIR was the key advocate for its defeat and, sure enough, the DREAM Act finally died this October. As he put it at FAIR's 25th anniversary celebration in 2004, just when the American nativist movement had begun to sense its own strength: "[T]oday," he said, "as the country moves finally into a serious and realistic debate, the founders have created a mature and knowledgeable organization prepared to lead."